Thuja Occidentalis, or Northern White Cedar (Arborvitae), grown throughout Wisconsin, except the southwest portion. It grows usually in moist areas where it is often found in dense stands. However, farther north and in Canada it appears on well-drained slopes, usually in with hardwoods. The bark is thin, gray to reddish brown, separating in long, vertical, narrow shredding strips. The foliage is scale-like; length 1/8 to 1/4 inches, arranged to make the small branches flat. In the fall Thuja can shed about one-third of its foliage. The fruit is small oblong cones that mature in one season, is yellowish-brown, 1/3 to 1/2 inches in size, with six to twelve scales and borne singly or in large clusters on ends of branches. Seeds are 1/8 inch long, with 2 narrow wings almost circling the seed. The wood is light, soft, brittle, coarse grained, durable, fragrant, and pale brown in color. It is especially important for making fence posts (which I hope none of you have to do with your bonsai), building poles, rot-resistant lumber, and shingles. Note: It is one of the preferred and important species for deer browse in the winter, so please do not feed the deer. When used for bonsai the driftwood style is popular for this “cedar” since the wood is relatively soft, nicely grained and easy to carve. Pruning and wiring can be done throughout the growing period. Pinching of new growth results in short, dense foliage. 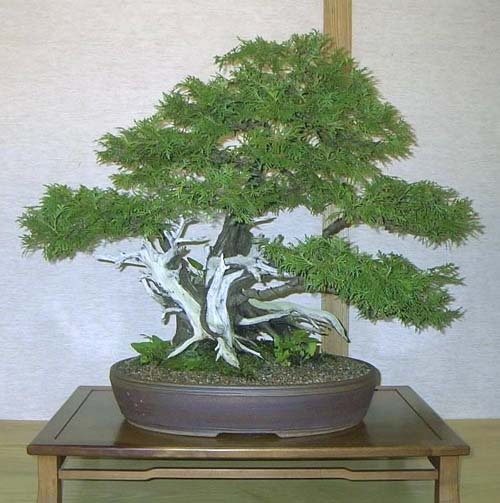 Although budding back on old wood has been noticed in nature, it has not been seen in bonsai. Fall shedding can be controlled some by timely pruning and pinching in late summer (September). Repotting may be done in the spring, always before the first of June. Repot about every three years. The potting mix must be well draining. Thuja has very fine roots that will rake out quite easily. Thuja will tolerate root pruning well. Fertilize with a high nitrogen 30-10-10 fertilizer which will give a deep green color to the foliage; apply every two weeks in the growing season. A lower nitrogen fertilizer like a well-balanced 20-20-20 can also be used. Different brands of fertilizer are recommended. Thuja is tolerant of being kept a little dry, but if you are not sure, water as you would the rest of your bonsai, but do not keep it extra wet. 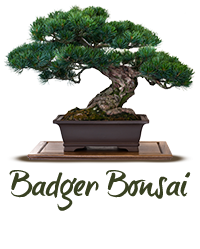 There are no pests or diseases to speak of when in bonsai. Thuja should be grown in full sun. Winter care is simple, as they are very hardy, tolerating below zero temperatures. Smaller trees could be dug in the ground to the top of the pot and mulched, or winter over as you would the rest of your outdoor bonsai. Wind protection should be provided as with all bonsai up here in the north. This is one of the easiest species to use for bonsai.